Allergy is a sensitivity to a specific substance called an allergen, which elicits a reaction and is usually contacted through skin, lungs, swallowing, or ingestion. An allergic response is a collection of symptoms caused by an immune reaction to substances that do not trigger such a response in most people. The immune system normally protects the body against harmful substances such as bacteria, viruses and toxins. Allergies occur when the immune system reacts to substances (allergens) that are generally harmless and in most people do not cause an immune response. 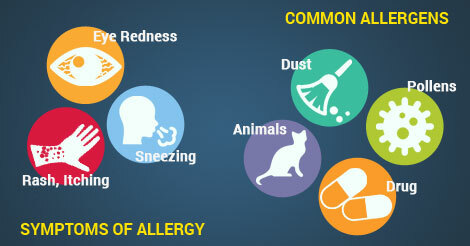 Various people report allergies ranging in a wide category from intolerance to dust, pollen to specific drugs. Here, we list a few of the common kinds of allergies. Localized Itching: Skin irritation from insect bites and stings, chemical irritants, hives, parasites (lice. pinworms). Generalized: Dry skin. Childhood infections (such as chicken pox or measles), aging skin, allergy caused by food or drugs (antibiotics), pregnancy, hepatitis, iron deficiency anemia, pityriasis rosea, psoriasis, dermatitis, renal failure, urticaria, drugs such as antibiotics (penicillin, sulfonamides), gold, griseofulvin, ionized, opiates, phenothiazines, or Vitamin A. The list of disorders which cause it is extensive and the exact cause can only be found out after detailed questioning. In addition certain skin lesions can be easily identified by the doctor e.g. seborrhic dermatitis, scabies, dry skin, hives etc. Medications are available to relieve itching. It must be emphasized that in addition to relieving itching, the underlying cause must be identified and treated by the health care provider. Moisturizers should be used for dry skin. Antihistamines are used orally when the itching is severe. Exposure to pollen, mold, dust and animal dander are some of the common environmental allergens. Allergy to environmental particles is a type of allergic rhinitis (Hay Fever). Hay Fever usually involves an allergic reaction to pollen. However, people may develop an allergic reaction to other particles in the environment. The pollens that cause Allergic Rhinitis vary from person to person and from region to region. In addition to individual sensitivity and regional plant prevalence, the amount of pollen in the air can be a factor in the development of Allergic Rhinitis symptoms. Hot, dry, windy days are more likely to have increased amounts of pollen in the air than cool, damp, rainy days where pollen is washed to the ground. Pollens that are carried by bees from plant to plant are seldom responsible for Allergic Rhinitis because the grains are large and have a waxy coating. Pollens that are carried by the wind are smaller and more often cause Allergic Rhinitis.